Chesapeake Cosmetic Dentist | Are You Brushing Properly? Many people may be surprised to learn that they have been brushing their teeth incorrectly for years. Improper brushing may cause oral health complications, including tooth enamel erosion and periodontal disease. Learn how to brush your teeth correctly and you can protect them for years to come. The most common way for people brush their teeth is by using a back and forth motion. This resembles sawing the toothbrush back and forth across the surface of the teeth until they feel clean and slippery. However, this is not an effective to brush your teeth. First, this method also does not clean effectively. Since the bristles are moving back and forth, they are essentially bouncing from one tooth to the next, which causes you to miss the spaces in between the teeth to remove plaque and other tiny particles of food. In addition, brushing with a sawing motion is very abrasive to your teeth and gums. This can cause you to scrub away tooth enamel, along with food debris. Overbrushing in this fashion can increase your risk of sensitivity, tooth decay, and receding gums. For a safer, more effective brushing method, start by placing your toothbrush at a 45-degree angle to where your teeth meet the gums. 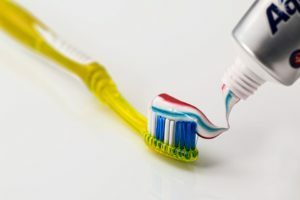 Then gently move your toothbrush back and forth and making sure the bristles cover each tooth and work their way around the sides of the tooth. This method allows you to find all the food particles and plaque in the spaces between your teeth. Note: if you use an electric toothbrush, you may still be overbrushing your teeth. Despite your instincts to scrub manually, an electric toothbrush yields best results when used to cover each tooth individually for a few seconds, then moved to the next. The brush itself provides all the motion needed to thoroughly clean the surfaces of your teeth. The value of proper brushing is often overlooked, but it is a vital part of keeping your teeth and gums healthy. Using the right method to brush your teeth will prevent build-up of harmful plaque that can lead to many oral health issues. Brushing properly can help prevent tooth decay, gingivitis, oral infections, and more. It can be challenging to retrain yourself after you have been brushing the same way for years. Switching methods may take some adjustment, but you will love the results. If you have any questions regarding the most effective methods of brushing your teeth, please contact our office.